Tattoos are worn by many people as a form of decorative accessory. They love to flaunt the body art form on their body parts. For such people the hand tattoos are a cool choice. All of us know that the hand is a pretty exposed part and any design or decoration that is placed here is sure to get eyeballs. However, the hand is a bony spot and it is not everyone’s cup of tea to bear the pain that ensues during the tattooing process. Therefore, you have to be patient and hardy enough to get a hand tattoo. As far as the design of these tattoos is concerned, you can choose from a huge variety. You can go for the elaborate and large designs or select the dainty and sweet looking girlish designs. There is simply no dearth of choices. All it takes is patience on your part and skill on the part of the artist to get a beautiful artistic result. Here we have presented a collection of 41 images that will give you fine details and ideas regarding the various aspects of the tattoos of hand. Take a look. If you liked our selection, perhaps these other posts will interest you too, Tongue Tattoos, Hope Tattoos, Filipino Tattoos and Chopper Tattoos. Classic red and blue rose tattoo graces the hand of the girl that is a symbol of love and beauty. The guy has got religious images carved on his knuckles that look very fine and detailed. The wearer loves animals and the tattoos on his hands express his liking and love. Comprising various colorful elements, this pair of hands tattoo serves as an excellent inspiration. The girl displays her hands covered with the good and evil theme tattoo design that always inspires her to follow her conscience. Anyone can confuse this hand tattoo for a real bracelet. Such is the look of this art piece. The girl wears her heart on her hand through this cute and simple tattoo piece. The slender hand of the girl is decorated with the name of her husband that is a symbol of love and commitment. The starry vine running on the hand in a wavy fashion makes for a charming tattoo design. This girl seems to have been inspired from Rihanna who also sports a fine tribal Maori tattoo on her hand. Make an edgy style statement with this eye tattoo sitting on the palm. This tattoo is dedicated to the pet of the wearer who is his closest friend. The three stars stand for the wearer, her husband and their child. It is a tribute to her lovely family. The girl got this tattoo to express her gratitude to god for having blessed her with a fabulous love life. The guy displays his aggressive attitude with this freaky grenade tattoo that looks quite distinctive. This tattoo signifies the love of the wearer for Victor Von Doom, the supervillain from Marvel comics. 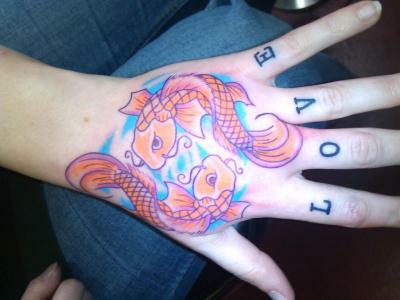 The Piscean girl got a pair of fishes on her hand to express her freedom loving and intuitive nature. Furious and freaky in outlook, this demon tattoo looks pretty scary and cool. This hands tattoo is based on the sea theme and symbolizes hope, pride and strength. The wildlife photographer expresses his love for antelopes with a colorful hand tattoo. Dark cat tattoo gracing the hand of the girl looks super scary and symbolizes the edgy attitude of the girl. Alice in Wonderland and Snowwhite portraits adorn the hands of the girl. They are a symbol of her liking and admiration for the fictional characters. This hand tattoo is the Irish Gaelic word for “Hope”. The wearer got it to honor her Irish heritage. These hand tattoos have an excellent catchy appeal and anyone who takes a look at them is surely going to feel good. The fine details gracing this hand tattoo look very clean and create a classic artful design. This hand tattoo reminds the wearer of his failures and helps him stay grounded. The Hindi hymns and the artful design together make for an awesome oriental tattoo. The wearer dedicates this cute skull tattoo to her kids and got it carved on mother’s day. Freaky to the core, this hand tattoo belongs to the quirky and cool category. Inspired by the fairy tales, this tattoo is a symbol of love for one’s daughter. Symbol of power, authority and strength; this lion tattoo inspires the wearer to be bold and brave. The eagle and the skull stand for the sharp and risk loving nature of the wearer. This hand tattoo of the wearer motivates him to be cheerful and positive. The black and gray skull tattoo looks very mysterious and symbolizes the painful past of the wearer. The girl and the cross bones along with the word poison make for a unique tattoo piece. The guy expresses his fascination for death and darkness with this devilish hand tattoo. Have a look at the hand tattoos on display, decorated with detailed intricate design. The wearer dedicates this tattoo to his wife and daughter, the two beautiful ladies in his life. The dot work and the curves produce an artistic tattoo design on the hand. Check out this brilliant tattoo piece that symbolizes hope, inspiration and motivation. This distinctive colorful design creates an exclusive hand tattoo.